VietNamNet Bridge – “I wanted to be a samurai. 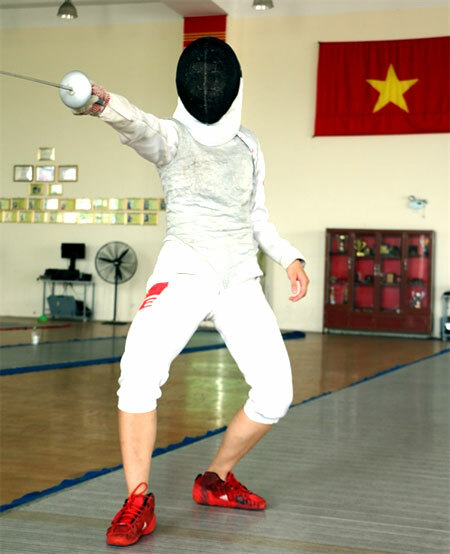 A sword would make me look like them,” Do Thi Anh said when asked why she had taken up fencing. Do Thi Anh seen during her training session at the Ha Noi Fencing Club. Anh first learned about fencing from Ore Wa Teppei (I Am Teppei), a Japanese comic about a little boy brought up by his father in the mountains. The energetic Teppei was tough and acted as free as a bird. His life changed completely when he started attending school, where he was soon recognised for his talent in sports, especially his bokken (wooden sword) skills. While practising bokken, the players had to wear armour that looked like that of a samurai. This was in 2011 and Anh was 15 years old. Five years later, she is one of Viet Nam’s 23 fencers who will compete at the upcoming Olympics in Rio de Janeiro in Brazil next month. Those who want to become fencers must have certain qualities, such as good height, long arm span and rapid reflexes. Anh meets all these requirements. Her only challenge was to persuade her parents to let her follow a sporting career. “I was a good student throughout. I regretted it a little bit when I decided to quit studies, while my parents strongly objected. They said sports would not bring me anything and asked me to focus on studies,” Anh said. “In the first few months, I spent just a short time at the fencing club when I was free. When I started making progress in training and competing, I decided to dedicate all my time to fencing, and my parents did not stop me anymore,” she said. 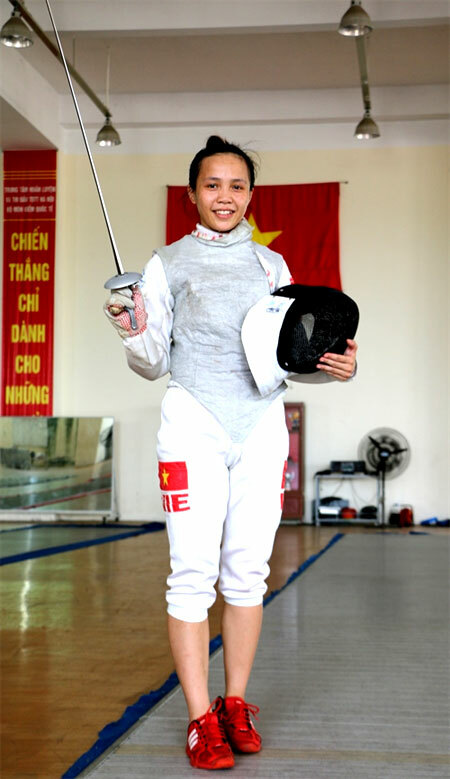 Ready for Rio: Do Thi Anh is one of four Vietnamese fencers to take part at the coming Olympics. Anh competes in the women’s foil event. The Hanoian girl needed only two years to get the national team coach to notice her after winning 12 national junior championship titles and a gold medal at the national championship in the foil event in 2013. She soon joined the national team. Since then, she has won several medals at local and international competitions. Anh has dominated in the Southeast Asian region for the last three years. She claimed a silver medal at her Southeast Asian Games debut in Singapore last year. “Đỗ Thị Anh is a girl of firm stuff. She is really professional while training and competing,” said Nguyễn Lê Bá Quang, head coach of the national fencing team. “She is hard-working and patient. These virtues make her a real fencer. But she is still young and her technique is not as perfect as required. So she needs more time to practise, and also needs experts to sharpen her skills and support from sport leaders to shine,” Quang said. Anh was selected to take part in an Olympic qualifying round, the Asia/Oceania zonal event in Wuxi, China, in April, even though she was not the national champion. The 20-year-old must be the luckiest player to qualify for the Olympics. Anh competed at the qualifier only for more experience for future competitions. But she performed better than anyone could imagine, making it to the semi-final round. Anh’s fourth rank was considered to be her greatest success, according to her coach, and the whole team was pleased to return home, with three of Anh’s senior teammates qualifying for the Olympics. News of her qualification came about two months later, when the International Fencing Federation (FIE) confirmed her selection in their official release. FIE said Anh lost to Yuan Ping of New Zealand, who then finished second in the women’s foil event. However, the former Commonwealth champion did not qualify for the Olympics because she was not chosen by the New Zealand Olympic Committee, as they were not convinced she would make it to the last 16. The FIE notified Viet Nam that Anh had been pushed up to the third position to take Ping’s place. She is the fourth fencer to make it to the team, with the others being Nguyen Thi Nhu Hoa (women’s epee), Nguyen Thanh An (men’s sabre) and Nguyen Thi Le Dung (women’s sabre). “She is our treasure,” said coach Pham Anh Tuan, manager of the Ha Noi Fencing Club. “Anh is a young player who will receive our strong support in the long term to shine in the future. Previously, she was not expected to participate in this year’s Olympics. According to our plan, she was to play at the 2020 Games,” Tuan said. National head coach Quang also shared Tuan’s opinion. “Honestly, she is lucky to get this ticket, but we could not deny her efforts and determination. It is a good start for her,” Quang said. “Anh is practising at Ha Noi Club, which is the best fencing centre in the country at present. If she receives more support for international training and competitions from well-known experts, she could become a world-class player,” he said. Anh is confident about her performance at the Olympics. “I do not worry at all. I do not care how strong my rivals are, they are the ones to defeat. Olympics is just a larger competition. I may not win a single match, but I always try my best,” she said. Anh will play 19-year-old Manila Calugareanu of Romania in the first qualifying round in Rio. Women’s foil events will begin on August 10, five days after the opening ceremony.